Climate change is an enormous and increasingly urgent issue. This important book highlights how humanities disciplines can mobilize the creative and critical power of students, teachers, and communities to confront climate change. The book is divided into four clear sections to help readers integrate climate change into the classes and topics they are already teaching as well as engage with interdisciplinary methods and techniques. 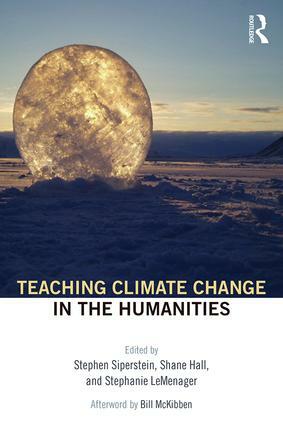 Teaching Climate Change in the Humanities constitutes a map and toolkit for anyone who wishes to draw upon the strengths of literary and cultural studies to teach valuable lessons that engage with climate change. Stephen Siperstein has a PhD from the University of Oregon and teaches English and Environmental Humanities at Choate Rosemary Hall in Wallingford, Connecticut, USA. Shane Hall is a doctoral candidate in the Environmental Studies Program and Department of English at the University of Oregon, USA. Stephanie LeMenager is Moore Professor of English at the University of Oregon, USA. She is widely involved in outreach projects and regularly engages with the press.